Snow Day Soup + Wild Winter Pickles for the perfect Lunch! 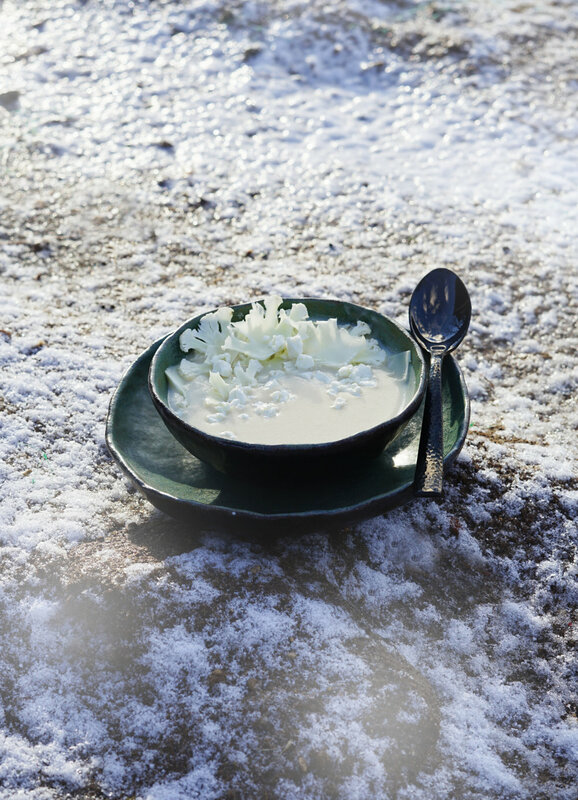 The depths of winter is a time for slow food and hearty meals. Our bodies crave the nourishment that can be found in long-simmered broths, fermented pickles, and slow-cooked root vegetables! This time of year it feels only natural to slow down a little, to plan ahead and keep something simmering at the back of the stove for a while. These were some themes that Hadas from Ancient Roots Mama and I talked about when we discussed collaborating on a meal! The beauty of social media is how it connects us all… I can meet fascinating and beautiful people all over the globe! With many of them I would love to be able to sit down and share a lunch but can’t physically travel the distance…so this was our creative way of meeting in the middle, so to speak. Together, we designed a balanced and hearty winter lunch by each contributing recipes, then we both cooked both recipes together. I got a little taste of what inspires her, and she got a taste of where my heart is at too. I love Hadas’s approach to health and lifestyle, and find her writings about Chinese medicine in relation to food really interesting. She’s contributed the recipe for Wild Winter Pickles, which are the perfect counterpart to my hearty goat cheese and white truffle potato soup. She’s shared her recipe for the pickles on her blog, which you can find here. This is a hearty white truffle and potato soup filled with the richness of goat cheese. It makes perfect sense to me that white truffle season is in the middle of winter, since its rich flavor pairs so well with the kinds of starchy and creamy foods I crave after a day in the snow! It’s the season of simplicity and heartiness, of leaving space in your life for both rest and play. And whichever you choose, this soup is comforting and filling. I call it “Snow Day Soup” because I actually first invented the recipe on a snow day! The city I live in had a few days of blizzard and, without the infrastructure to deal with that much snow, things pretty much shut down. Having grown up in the mountains, I was prepared - since my car was completely buried and the roads were basically solid snowbank, I strapped on my cross country skis and skied to the store. There, I grabbed a couple of things that sounded good and stopped to play in the snow on my way home. This was a wonderfully hearty way to wrap up such a magical day! A note on white truffles: these extremely flavorful fungi are found mostly in the winter months in the soil of coastal rainforests. They’ve been cultured in Europe for centuries, but can also be found in the wild here in the Pacific Northwest by using specially-trained dogs or ethical harvesting techniques. I made my own white truffle oil by grating fresh white truffles into high-quality olive oil and allowing it to infuse for a couple of days, but you can also purchase white truffle oil at specialty food stores. Be sure to verify that it’s made with real white truffles, as artificial truffle oil is quite common. (It’s still delicious but lacks some of the earthy complexity that makes the real thing so special.) With white truffle, a little goes a long ways and it pairs exceptionally with starchy or creamy foods (I love it on popcorn!) This cheesy and creamy potato soup is the perfect way to highlight its rich flavor. Heat the oil in a pot over medium heat. Add the onion and saute until tender and transluscent. Add the garlic and cook just until fragrant. Add the potatoes, broth, and salt and bring to a boil. Cook until potatoes are tender, about 20 minutes. Pour the mixture into a blender and puree until smooth. While still hot, stir in the yogurt, pecorino romano, and chevre. Stir in the white truffle oil.